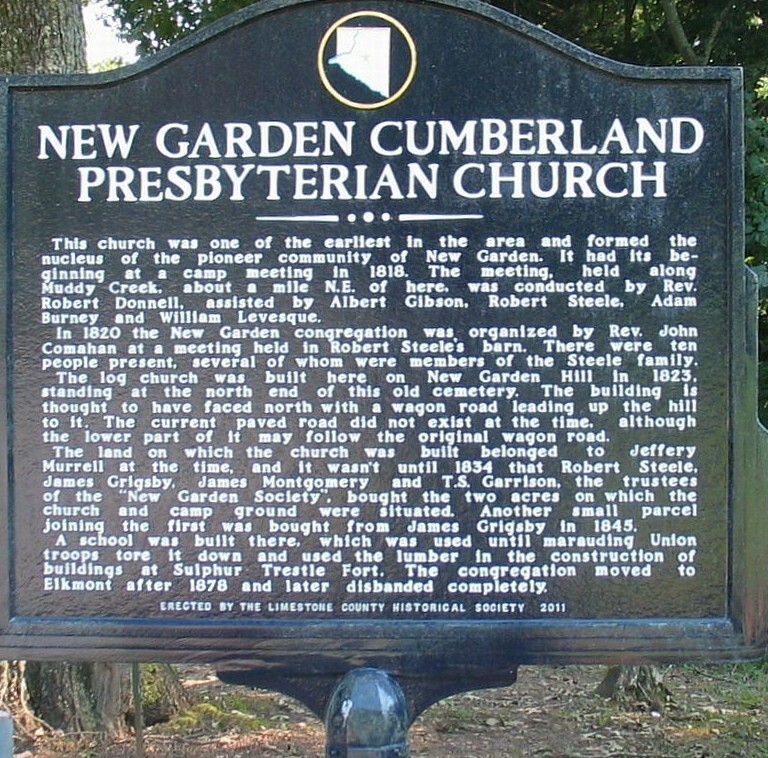 THE HISTORY OF THE CUMBERLAND PRESBYTERIAN CHURCH IN ALABAMA PRIOR TO 1826. The next authentic information is obtained from the minutes of the old synod, virtually the General Assembly, in 1823. These records, by the way, were lost from our history until recently when they were discovered by the Rev. John V. Stephens, D. D., professor of ecclesiastical history, Cumberland University, Lebanon, Tennessee. The synod held its session at Russellville, Kentucky, Oct. 21. From this source it is learned that the Rev. R. Bell was present as a member from the Alabama Presbyterian, while the Rev. Messrs. John Forbes, William Moor, and Benjamin Lockhart were the absentees. The Rev. R. Donnell was chairman of the committee on the state of religion. This committee gives, in its report, statistics of the various presbyteries except the Alabama. “Whereas,The members of the Alabama Presbytery live remote from each other and are separated by water courses difficult to pass in time of high water. “Resolved, That said presbytery be dissolved, and that Rev. Messrs. Robert Bell and John Forbes of the Alabama Presbytery and John Malloy and J; C. Smith of the Tennessee Presbytery constitute a presbytery to be known by the name of Bigby [Tombigbee] Presbytery at Abner Boan’s in Monroe county, State of Mississippi, on the 24th of January next, including the following boundaries, viz: Beginning at the mouth of the Mobile river, thence up said river to the mouth of the Black Warrior to the road leading from Florence to Tuscaloosa, thence with said road to Tennessee Presbytery line, thence with said line to the Tennessee State line, thence with said line to the Mississippi river, thence south to the undefined boundaries; that Robert Bell be the first moderator, and, in case of his absence, John Forbes. The Rev. Messrs. William Moor and Benjamin Lockhart, with the remaining bounds of the Alabama Presbytery, be attached to the Tennessee Presbytery, and that the minutes of said presbytery, with the licentiates and candidates belong to the Tennessee Presbytery, except Daniel Patton who shall be attached to the Elk Presbytery.”—Minutes of the Cumberland Synod, 1823. It gives the date of the extinction of the Alabama Presbytery, original. There were four members of the Alabama Presbytery, original, at the time of its dissolution, viz: The Revs. R. Bell, J. Forbes, Wm. Moor, and B. Lockhart. Mr. Forbes appears as an addition to the charter members, whether by synodic or presbyterial act is not known. Messrs. B. Lockhart and W. Moor became members of the Tennessee Presbytery. The Revs. R. Bell and J. Forbes became factors in the Bigby Presbytery—two of its charter members. Mr. Bell was appointed by the synod first moderator of the new presbytery, Mr. Forbes being named as his alternate. There must have been at least one meeting since the minutes are to be given into custody of the Tennessee Presbytery. The writer, however, knows nothing of said meeting or meetings. The records are doubtless destroyed with the early minutes of the Tennessee Presbytery when the latter were burned. The same remark is rendered necessary since reference is made to licentiates and candidates. These could come in only by presbyterial act, unless given in the act creating the presbytery, or by subsequent change of presbyterial lines. All this comports with what has been said regarding the bounds and the work, and the difficulties of the Alabama Presbytery, original. In keeping with these facts the records of the synod, meeting at Cane Creek, near Fayetteville, Lincoln county, Tennessee, October 19, 1824, register Mr. Bell as a member of the Bigby and Messrs. Lockhart and Moor as members of the Tennessee Presbytery. Messrs. Lockhart and Moor remained in the then new State and pressed their work. Others, mostly workers of a somewhat transient kind, were doubtless in the field aiding. These two men, be it remembered, were our fixities—our denominational dependence. They held the field until the reorganization of the presbytery. Thanks be to these good, self-denying, self-sacrificing men! Blessings on their names! They cannot—cannot—die! “The righteous shall be had in everlasting remembrance!” Let their church never forget her debt of gratitude to the men who have so heroically planted her banner in the fields at home and in the lands afar off. I have submitted the records. These, I suppose, will be regarded official. The doctor is certainly in error in reference to the residence of at least two of these ministers. The session of the General Synod, 1823, held at Russellville, Ky., Oct. 21, et seq., made provision for the Bigbee [Tombigbee] Presbytery. 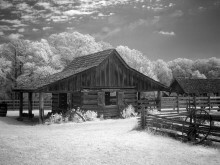 This was in harmony with the reigning policy—a presbytery as early as there appears reasonable prospect of its success. This new presbytery would occupy mainly Mississippi soil. Its eastern limits would lie within Alabama, embracing the northwest corner of the State. For some cause, doubtless satisfactory, the presbytery failed to formally organize upon the day and at the place appointed. This is the third presbyterial body whose limits should hold any part of Alabama. 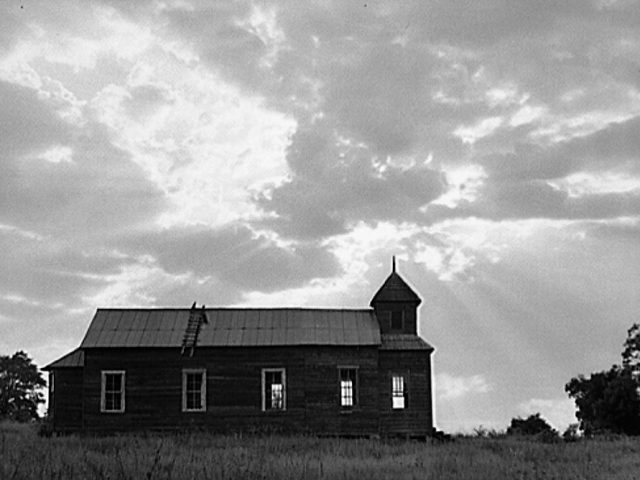 As it was never organically in existence, it might be called “The Tombigbee Presbytery, provisional.” Nothing at all is known of its character. The dissolution of the Alabama Presbytery, original, left the Revs. B. Lockhart and W. Moor laboring within the bounds of the Columbia—later the Mississippi—later still the Union—now the Alabama—Synod. 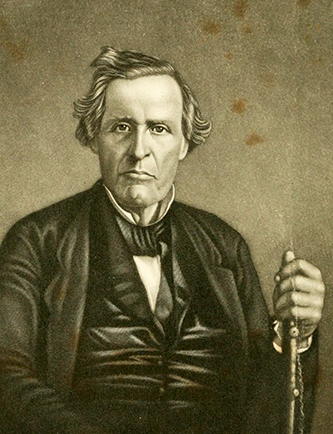 Sometime during the spring of 1822, Messrs. J. W. Dickey and John Williams, both licensed preachers in the Elk Presbytery, entered Middle Alabama. These all made Elyton—then the metropolis of Jones Valley, near the present city of Birmingham—their center of operations— their radial point. They spent, in circuit riding, some two years in this field and in South Alabama. Messrs. Lockhart and Moor were, of course, busy in their respective circles. From its records, I find that Hopewell, three milles south of Bessemer, was organized by Mr. Lockhart and others October 21, 1823, three days before the Alabama Presbytery, original, was dissolved. In like manner I find that Revs. Lockhart and Williams organized Mt. Calvary, in Clayton’s Cove, April, 1824. There were other churches, but I have been unable, after diligent search, to ascertain their names, their location, the date of their organization or by whom. 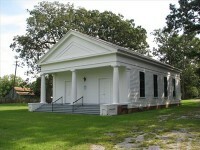 The Elk Presbytery, at her spring session, 1824, appointed a commission whose duty it was to proceed to Marion, South Alabama, and ordain the young men Dickey and Williams. This commission was composed of the Revs. Albert G. Gibson, Benjamin Lockhart, William Moor, and A. J. Steele. These all, at the time appointed, proceeded to Marion and formed a presbytery for the discharge of the duty assigned them by electing Mr.Moor moderator, and Mr. Gibson clerk. 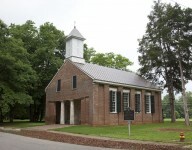 Here, June 1, 1824, J. W. Dickey and J. Williams were solemnly ordained and set apart to the work of the ministry. The ordination sermon was delivered by the Rev. A. G. Gibson, the Moderator presiding and giving the charge. The prayer of consecration was offered by Mr. Steele. This ordination was the first that ever occurred at the hands of the Cumberlands in Middle or South Alabama. It took place in the home of old brother Alexander George, a pioneer and veteran Cumberland, who resided on Bogue Chitto creek, Perry county, distant only a little way from Marion, then known as Muckle’s Ridge. In those days such meetings as this were called “intermediate meetings” of the presbytery. The two terms “intermediate session” and “commission” were used interchangeably. There was no organized church at Mr. George’s, for Mr. Steele, writing to me under date of Feb. 8, 1886, said of the further work of the commission: “We organized a church there of twenty members. Old father George was made an elder. Others were elected, but I cannot recollect their names.” From records I have learned that this local church was called Elim, afterward Jericho. Herein we have given the creation of the first presbytery whose territory lay wholly within the State. 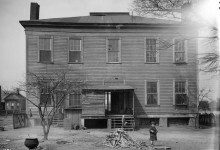 It is referred to in our history as “The Old Alabama Presbytery.” I shall in my history refer to it as “The Alabama Presbytery, old.” I shall revert to it presently. Since the ministers herein named are “attached” to the presbytery, it would seem that the rolls of the two authorizing acts differed. This was doubtless done so as to make the presbytery a possibility. The northwestern portion of the State was held within the borders of this new presbytery. 17 Minutes of Synod, 1824. The presbytery, so far as I am informed, met and was duly organized at the time and place mentioned. The records of its life and work are not accessible to me. Besides, it is not expected that I shall further pursue it, as I am at the goal of my task. In pursuance of the synodic action, the Alabama Presbytery, old, was, April 1, 1825, organized. It would scarcely be correct to say that it was reorganized, unless the term be used with much latitude. The reader will bear in mind that the Cumberland Synod embraced the entire Cumberland Presbyterian Church at this period. The Alabama Presbytery, old, was, of course, subject to her oversight. 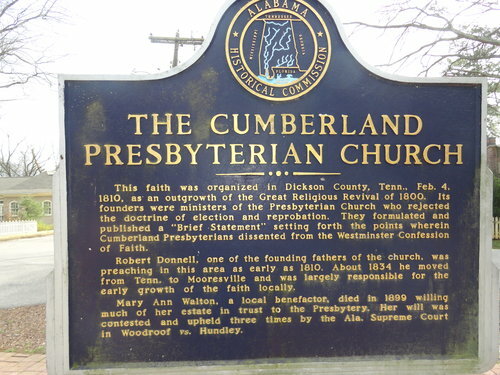 “The Alabama Presbytery of the Cumberland Presbyterian Church met, agreeably to order of [Cumberland] Synod, at Alexander George’s, Perry county, State of Alabama, on the first Friday in April [April 1], 1825. “The opening sermon was delivered by the Rev. William Moor, on ii. Cor. v :20: ‘Now then we are ambassadors for Christ, as though God did beseech you by us; we pray you in Christ’s stead, be ye reconciled to God. “members Present: The Rev. Messrs. William Moor, John Williams and James W. Dickey. Absent: The Rev. Benjamin Lockhart. Elder: Alexander George, from the Elim Society. Representative: Hugh Morrow, from Hopewell and Elyton Societies. “The Rev. William Moor presided as Moderator, agreeably to the order of Synod. “The Rev. James W. Dickey was chosen clerk. “The Rev. Vincent Hubbard, of the Tennessee Presbytery, was invited to a seat as a corresponding member. “Presbytery adjourned to meet at Elim meeting-house of this society and neighborhood to-morrow morning at 9 o’clock. “Presbytery met agreeably to adjournment, constituted with prayer. Members present as on yesterday. “ordered, That the Revs. Benjamin Lockhart, John Williams, and James W. Dickey administer the sacrament of the supper in Bethany society on the fifth Sabbath in July; in Shiloh, on the third; and in Mt. Moriah, on the fourth Sabbath in September. “ordered, That the Revs. William Moor, John Williams, and James W. Dickey administer the sacrament of the supper in Elim congregation on the second Sabbath in September. “ordered, That the Revs. Benjamin Lockhart, William Moor, John Williams, and James W. Dickey administer the sacrament of the supper in Elyton society on the first Sabbath in October next. “Bryson T. Dobbins came forward and related his experimental knowledge of religion and call to the holy ministry, and, presbytery having received testimonials of his good moral character and of his being in the communion of the Church, received him as a candidate for the holy ministry. Ordered, That he prepare a written discourse on Amos iv: 12: ‘Prepare to meet thy God,’ to be read at next presbytery. “The presbytery adjourned to meet at Elyton, Jefferson county, Ala., on the 30th of September next. 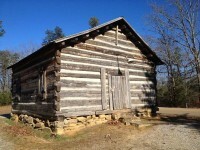 The first meeting of the presbytery was held in Perry county, April 1-3, 1825. The first Moderator was the Rev. William Moor. The first clerk was the Rev. James W. Dickey. The first visitor was the Rev. Vincent Hubbard of the Tennessee Presbytery. The first probationer was Mr. Bryson T. Dobbins. The first representatives were Messrs. George and Morrow. “MS. records, vol. i, pp. 1-2.
to Coffee Springs. It is believed that this list names and locates all the churches in middle Alabama prior to January 1, 1826. I am wholly unable to list with certainty the congregations of North Alabama. There were churches, of course, in that part of the State, but I have not been able to ascertain their birthday and location. I name four, to-wit: Canaan, Madison county, Huntsville, Hermon, and Kelly’s Creek. Those were organized prior to 1813, and all likely by the Rev. R. Donnell. 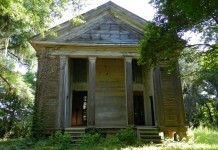 The presbytery, according to its adjournment, met at Elyton, Sept. 30, 1825. All the ministers were present. The elders present were: Charles C. Clayton, Josiah Reed, Weyman Adair, Hugh Morrow, William Hall, James Hall, and William Cameron, representing respectively the following congregations: Mt. Calvary and Turkey Creek, Lebanon, Elim and Salem, Hopewell and Bethany, Mt. Moriah, Elyton, and Shiloh. During this sitting, the following candidates were received, viz: Messrs. Bartholomew Clark and Peter W. Littlepage; the former on Sept. 30, the latter, Oct. 3. “That the Rev. James W. Dickey ride once round the Jones’ Valley circuit, and the balance of his time on the Alabama circuit between now and next [meeting of] presbytery. The Rev. James W. Dickey was appointed stated clerk of the presbytery. The body adjourned to meet with the Lebanon church, Dallas county, March, 1826. From the minutes of Cumberland Synod, in session at Princeton, Caldwell county, Ky., Oct. 18, 1825, I find that the Revs. James W. Dickey and John Williams were present, while the Revs. B. Lockhart and W. Moor were absent. The last two were the old men, so to speak, of the presbytery, and could not take so long a horse-back ride. The records of the presbytery were present and were reviewed by the following synodic committee, viz: The Revs. James Y. Barnet, Frank M. Brawley, and Robert Baker. Here my pen must rest. I have come to the limit set myself. It has cost me hours and days of hard work to gain the materials for this article. How far it falls short of its ideal no one knows better than the writer. Knowing that what I shall say may be used by those who may succeed me has made me duly careful and conscientious in every statement. If there is one error or inaccuracy in it, I am ignorant of it after exhausting the means at my command for informing myself. 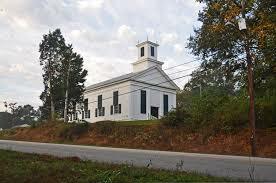 As stated above, the advent of the Cumberland Presbyterian Church in Alabama dates from 1808. The first presbyterial organization in the State dates from an order of the General Synod, of Oct. 18, 1821, constituting the Alabama Presbytery. It was organized, but soon became defunct. In 1824 it was reconstituted, and on April 1, 1825, its first session was held at the house of Alexander George in Perry county. 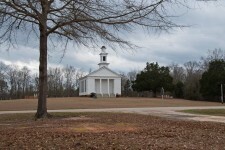 This remained the only Presbytery in the State until the formation of Elyton in 1832, and Talladega in 1836, as it was also the chief local presbyterial organization of the State until the Union Synod was constituted in 1836. The 8th General Assembly on the 3rd Tuesday in May, 1836, constituted the Union Synod, with the Alabama, Elyton and Talladega Presbyteries. 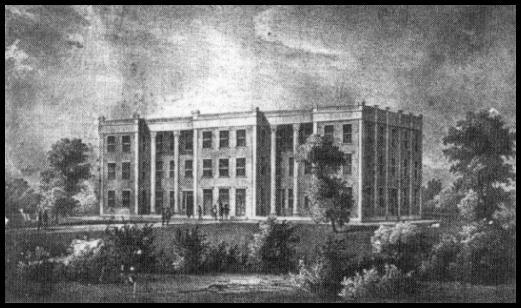 It held its first session at Elyton, Nov. 17, 1836. Prior to this the records of the Church of a synodical nature are found with the Columbia Synod. It remained the Union Synod until 1867, when the name was changed to Alabama Synod. “Revised from the Report of the Alabama History Commission (Miscellaneous Collections, Alabama Historical Society), pp. 132-134. (3) Records or minutes of the church session, which is the record of all business of the individual churches. The two former have been irregularly printed. No attempt has been made to ascertain the condition of the third class. RECORDS OF THE UNION AND ALABAMA SYNOD. Minutes, Nov. 17, 1836-Nov. 2, 1854. 1 vol. Minutes, 1855-1887. 1 vol. Minutes, 1888-1897. 1 vol. Minutes, 1898-1900. 1 vol. The originals of the two first named are in the hands of Rev. J. H. B. Hall, Birmingham. Copies of these, with the originals of the two last are in the custody of Rev. W. B. Witherspoon, stated clerk, Huntsville, Ala. I. Alabama (original) Presbytery, constituted Oct. 18, 1821. Minutes presumably lost. 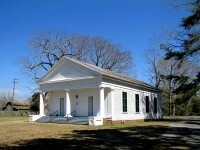 Alabama (old) Presbytery, reconstituted on October 22, 1824, and first meeting held April 1, 1825. Minutes, April 1, 1825-Oct. 3, 1867. 1 vol. Elyton Presbytery, constituted in 1831, and first meeting held April 12, 1832. Minutes, April 12, 1832-Feb. 12, 1866, also a part of 1869. I vol. 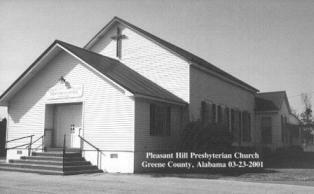 Alabama (new) Presbytery, reorganized in 1883, by consolidation of Alabama and Elyton Presbyteries. Minutes, April 2, 1868-Sept. 20, 1890. 1 vol. Minutes, April 23, 1891-1898. Same vol. also contains Minutes of Birmingham Presbytery, Oct. 10, 1898-Feb. 9, 1900. I vol. 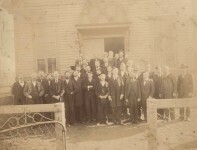 Birmingham (old) Presbytery, organized, October., 1896. Minutes, Nov. 5, 1896-June 1, 1897. 1 vol. These were destroyed in the burning of the Montezuma University, Bessemer, Ala. A small volume of MS. notes kept by Rev. M. W. Robison was preserved and is in the hands of the Rev. L. B. Cross, Gastonburg, Ala.
Birmingham (new) Presbytery, reorganized in 1898, by consolidation of Birmingham and Alabama Presbyteries. Minutes, Oct. 10, 1898-Feb. 9, 1900. Included in second vol. of Minutes Alabama Presbytery, supra. All of the foregoing are in the custody of Rev. Luther B. Cross, stated clerk, Gastonburg, Ala., except the first above noted, which is in the possession of Rev. J. H. B. Hall, Birmingham. Synod. II. Talledega Presbytery, organized 1836. Minutes, 1836 to 1867. I vol. Minutes, 1867 to 1882. 1 vol. Minutes, 1882 to 1897. I vol. Minutes, 1897 to 1900. I vol. These are in the custody of Rev. J. R. McMullen, stated clerk, Fort Payne, Ala.
III. Springville Presbytery, organized 1880. Minutes, March 5, 1880-July 15, 1886. pp. 253. Minutes, Dec. 9, 1886-March 6, 1896. pp. 252. Minutes, Sept. 18, 1896-1900. (Current.) These are in the custody of Rev. R. P. Taylor, Stated Clerk, Leeds, Ala.
IV. Robert Donnell Presbytery, organized 1890. Until the above date the churches composing this body were parts of the Jackson Presbytery and the Tennessee Presbytery. The location of the early manuscript minutes is unknown. Pamphlet minutes for all meetings have been published. Minutes, March 31, 1893 to Aug. 4, 1897. 1 vol. Minutes, Sept. 1897 to 1900 (current). 1 vol. These are in the custody of Rev. H. N. Barbee, stated clerk and treasurer, Athens, Ala.
V. The New Hope Presbytery, organized by act of the Mississippi Synod, Nov. 18, 1838, and held its first meeting at Louisville, Miss., Dec. 21, 1838. The records of both the New Hope Presbytery and the Mississippi Synod are in the keeping of the Rev. J. H. Zwingle, stated clerk, Starksville, Miss. Their condition is not known. VI. The McGready Presbytery, organized 1840 or 1841. The records prior to April, 1863, were destroyed by the accidental burning of the home of the Rev. W. H. Baldridge, stated clerk. The subsequent minutes are in the custody of the Rev. 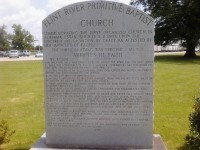 B. F. Finch, stated clerk, Pleasant Site, Ala. Their condition is good. Vintage photographs from around Cullman – Do you have more information about them? Could you walk eight miles each day to get to your job like this? JHumbug Graham, I thought you might enjoy this article. Lynn Jones I think you might be interested in some of this Presbyterian history. I read this just now. Thanks. “The Presbyterial connection prior to 1825 cannot be ascertained. William Porter, Robert M. Cunningham and James Sloss, ministers.